I saw a headline, "Shire horses could become extinct within 10 years, experts warn." The article is obviously UK-centric, but does anyone know breed numbers for drafts here in the US? 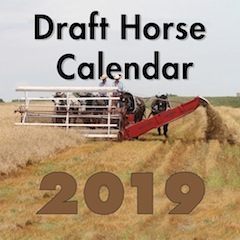 I don't think there are any exact draft horse numbers available in the US, since many breeders do not register their horses with the respective associations. Also, as I was told, transfers are only reported if people want to have offspring registered or show their horses. I myself have two Percherons, one of which I have papers for, whose transfers were not reported to the Percheron Horse Association. I do not know anything about the Shires, Clydesdales or Suffolks, but I assume the situation is similar. In Great Britain, by the way, they are also breeding and importing Percherons as well as Ardennais Horses, so the warning may be a little too dire when it comes to heavy horses as such. I know for sure, that heavy horses are being bred in larger numbers in Germany again as when I left there.